« Is Royal Mail killing off its Internet Delivery Business by mistake? 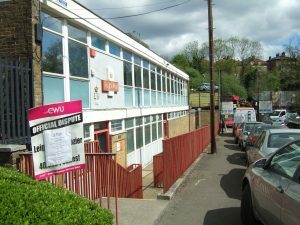 Last week I used the appeals for support for the forthcoming demonstration in support of the CWU Campaign to halt the closure of the SE27 Sorting Office to illustrate how Royal Mail appears to be exiting the Internet Delivery market – albeit probably by accident rather than design. It has been suggested that I post a couple of photos to illustrate Royal Mail’s dilemma and why the protestations of those, from all parties (I too have signed the petition), who will be demonstrating against the closure, should not be taken at face value. I anticipate that, on the day of the demonstration, the council will enforce parking regulations and remove vehicles parked on the pavement outside the sorting office, blocking access, including for the disabled. 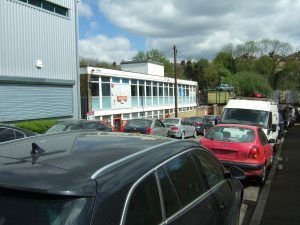 West Norwood Sorting Office – sandwiched between a scrapyard and a NACRO training centre. It is down a narrow side street off what is probably the United Kingdom’s most neglected High Street outside the some of the former Welsh mining towns. 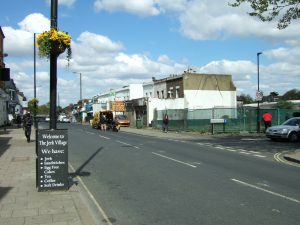 Junction of West Norwood High Street and Windsor Grove where the sorting office is. The surrounding area is wealthy and the leafy suburban streets are regularly clogged with vans delivering goods ordered over the Internet. But the heart of West Norwood, (once a centre for leading-edge radio-age technology alongside a vibrant artistic community, where the night buses and trams from the West End carrying actors and musicians met the daytime transport for wealthy commuters from the City with competing bus and tram garages), has become run down with decades of planning blight. Even the library has been closed for five years and will now be replaced by something adjacent to the foyer of a multi-screen cinema with no parking. Nearby, the site of one of the UK’s great technical colleges, once the home of marine radio training (one of the largest manufacturers was nearby), supposedly reserved for educational or industrial use is now occupied by a Big Yellow storage depot and some derelict land. That land might make a good location for a sorting office, but is not available because some-one else wishes to use it for a distribution depot. Meanwhile those who think the area would be ideal for multi-media businesses who cannot afford Shoreditch, are ignored because the area currently lacks globally competitive broadband backhaul. West Norwood does need an Internet Age delivery and collection service. But Royal Mail also needs Internet Age sorting offices. Fighting to keep a depot that is probably suitable for neither, does not make sense. But nor does making customers make a “two bus” journey to collect that which could not be delivered because they were out. What has those to do with IT? It brings the arguments down to earth. whether the economics of Internet businesses are based on efficiency or tax avoidance. whether freedom of movement is about genuine skills shortages or about replacing UK professionals by cheaper Indian (more than EU) technicians. whether those who fail to use technologies now available to protect customers from abuse should be able to avoid legal liability for the consequences. Then there is the question of whether the negotiations should focus on the future relationship we want with Europe, the bits of the current relationship we want to keep or the divorce settlement. My own view is that we should focus on the future relationship we want – including arrangements for the physical delivery of goods across borders (whether ordered over the Internet or not). This beings us back, of course, to the for a proper discussion on the future of Royal Mail.